There’s only one thing that will make your customers want to come back to you more than the amazing customer experience. It’s the amazing personalized customer experience. According to our latest customer experience research, 56% of customer experience professionals aim to improve and personalize the customer experience. No wonder why: personalization at scale can drive between 5 and 15% revenue growth for companies in the retail, financial-services, entertainment, telecom, and travel industries. Personalization in customer experience means designing or producing services and products to meet customer's individual requirements. You’re most likely already familiar with marketing personalization. Personalization starts with “Hello, Susan” at your inbox and goes far beyond that to personalized offers and services. Personalization is already a necessity to survive and thrive in the era of the empowered customer as 33% of consumers who abandoned a business relationship in 2016 did so because personalization was lacking. No article on personalization goes without mentioning Amazon, the leading customer-centric company. Customer focus are embedded in the DNA of the company. “Put the customer first. Invent. And be patient.” - says Jeff Bezos, CEO of Amazon. Amazon knows a lot about their customers based on their purchase history, so they personalize and offer their customers special offers based on the customers’ interests. This type of personalization not only increases customer satisfaction but also drives loyalty and repetitive purchases. Indeed, according to the research, more than a half of online shoppers believe that retailers who personalize their offers provide a valuable service. Even more interestingly, 45% of consumers are more likely to shop on a site with personalized offers. Another well-known customization leader is Netflix. Netflix has revolutionized movie and online entertainment industries. 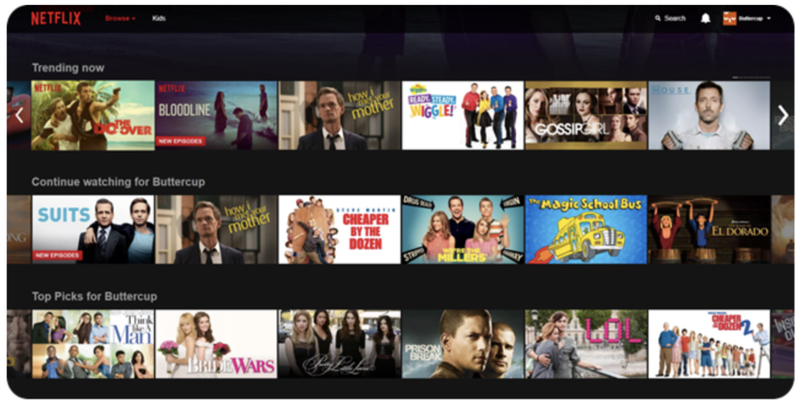 Netflix captures the intent of the users, constantly researching the interests of their customers. Based on the user behavior, you might find an actor that you recognize, an exciting moment like a car chase, or a dramatic scene that conveys the essence of a movie or TV show in your feed. “This is yet another way Netflix differs from traditional media offerings: we don’t have one product but over a 100 million different products with one for each of our members with personalized recommendations and personalized visuals.” - shares the tech team of Netflix. Despite recent privacy controversies with Facebook, the social media giant has mastered the art of personalization up to perfection and has a lot to teach us. Facebook personalizes all the content that a user gets: user feed and updates, local event suggestions, ads, marketplace offers and so on. By personalizing the whole user experience, Facebook catches our attention and develops a strong connection to the user. Often, to create a memorable service, you don’t have to collect all the customer data online, but to be there with them. Talk to them, listen to them and remember them. A great example of such a company is Mojo Coffee, a chain of coffee shops in New Zealand. Despite having 30+ coffeeshops, each of them has a unique atmosphere and a close relationship with their visitors. “What makes Mojo different from other coffee shops is it’s got the resources of a large company, but definitely with the heart of a small company. We ask you how your day is going and we remember your name and what you like to drink, how you like to drink it. So it’s those small touches, those fine details, that make Mojo a special place.” - Christian Cook, Mojo’s barista, says in the interview. Check another example of personal relationships affecting impression and experience of the customer by Shep Hyken, customer experience expert and key-note speaker. Shep describes his experience when staying in a hotel in New York. He had a short chat with reception workers and to his huge surprise, they remembered that he mentioned his wife is coming and prepared for her visit by sending up a bottle of wine, some fruit, and chocolate, in addition to a framed picture of them together, which totally amazed Shep. “Regardless of the type of business you are in, there is always an opportunity to personalize the customer experience,” - concludes Shep. Personalization can be a powerful marketing tool if combined together with the virality of social media. You might remember “Share a Coke”-campaign when Coca-Cola replaced their logo with personal names on the bottles. Coca Cola allowed its customers to self-express and stay connected with friends while unknowingly promoting the brand. For example, when a consumer shares a name-branded Coke bottle with their mother, they feel as if they are honoring their mother rather than promoting the Coke brand itself. The campaign went viral in Australia where it started, and the brand decided to spread it across the globe in over than 80 countries. The results have been astonishing. After almost a decade of declining Coca-Cola consumption, Australia estimated that the campaign increased the consumption of Coke by young adults by 7% and in the US, the sales have increased by more than 2%. While personalization has been a hot trend during the recent years, privacy concerns have also been on the rise. Which one is more important: privacy or personalization? As customers we want businesses to know our needs and suggest services and content, yet when companies appear to have all these insights we freak out and are much less likely to engage with them. That isn’t news. According to the Accenture’s research done among US population, 58% of consumers would switch half or more of their spending to a provider that excels at personalizing experiences without compromising trust. There are differences between age groups. 64% of millennials value anticipation and customization of the experience, which requires utilizing their transaction data, over privacy concerns. Among this group, 46% value personalization, which requires also preferences and contact info, over privacy concerns. At the same time, 45% of baby boomers (age 55 and over) value privacy over personalization. Large part of consumers highly values the personalized experiences they get. Look at the examples we discussed: Netflix would not be as successful as it is, without the smart targeting it is able to do. But the privacy concerns do exist. Therefore both businesses and consumers need to evolve their ways of working. Customers need to pay closer attention to what they’re agreeing to and take responsibility for sharing their information. But this is only possible, when businesses strive to be more transparent when it comes to the use of the customer data.